When tooth decay reaches a nerve, the pain can be severe, and if left untreated, can result in serious infection. In years past, extraction was often the only option. 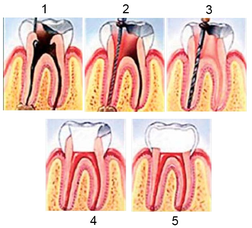 Endodontic treatment, also known as a "root canal," can often save a deeply decayed tooth. The process is relatively simple, can usually be completed in one to three visits. Using a dental laser, Dr. Eng will remove the decay and damaged nerve tissue, then perform appropriate restorative work to return the tooth to it's original, healthy appearance. With proper oral hygiene, the tooth can last a lifetime.